This document is an OASIS Committee Draft. This specification defines the Universal Business Language. A small set of XML schemas for common business documents such as “Order,” “Despatch Advice,” and “Invoice” that are constructed from the UBL library components and can be used in a generic order-to-invoice trading context. Support for the customization of UBL in specific trading relationships. UBL schemas are modular, reusable, and extensible in XML-aware ways. Designed as an implementation of ebXML Core Components Technical Specification 2.01, the UBL Library is based on a conceptual model of information components known as Business Information Entities (BIEs). 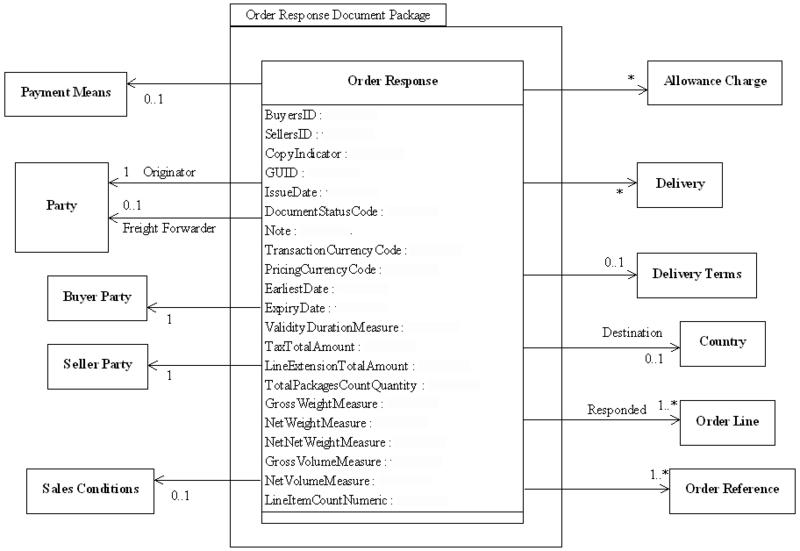 These components are assembled into specific document models such as Order and Invoice. These document assembly models are then transformed in accordance with UBL Naming and Design Rules into W3C XSD schema syntax. This approach facilitates the creation of UBL-based document types beyond those specified in this 1.0 release. This document describes the basic order-to-invoice business process that the UBL document types are designed to support. 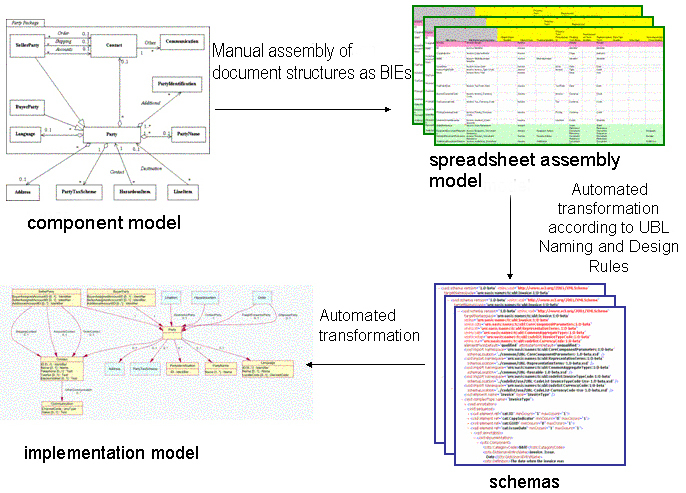 A tree-structured model that can be implemented as a document schema. A representation of normalized data components describing a potential network of associations and roles between object classes. 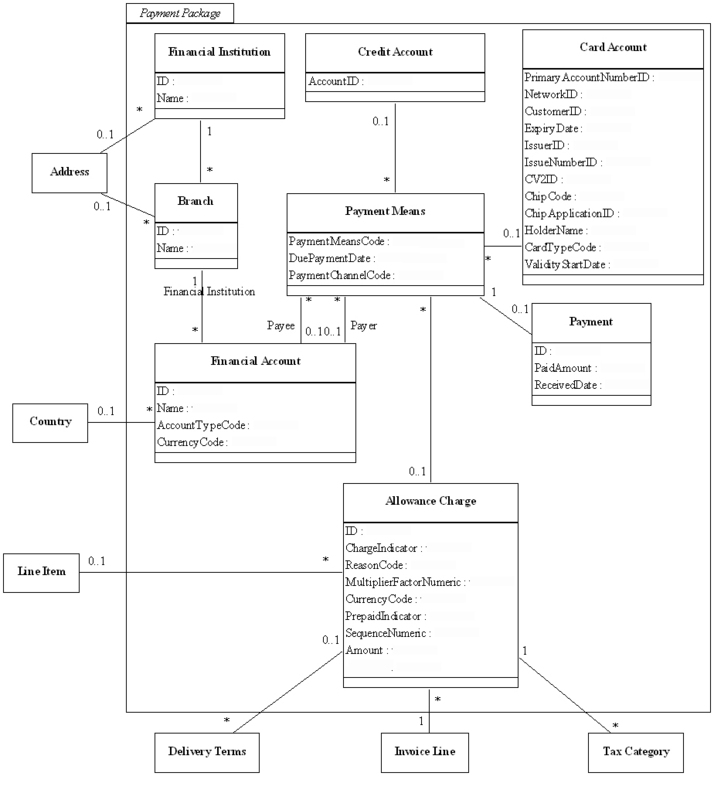 A refinement of a class diagram that emphasizes the dependent associations between object classes. A means of aggregating components based on whether the values of a set of properties change when another set of properties changes, that is, whether the former is dependent on the latter. A formal technique for identifying and defining functional dependencies. The UBL 1.0 documents and component library are designed to support a typical order-to-invoice procurement cycle. This section describes the business rules and choreography of the generic process and the role played by each of the UBL 1.0 document types in that process. It is important to note that the UBL library is designed to support the construction of a wide variety of document types beyond those provided in the 1.0 package. It is expected that other document types will be added as UBL evolves. The bold boxes in the diagram below show the role of each document type in the generic process. 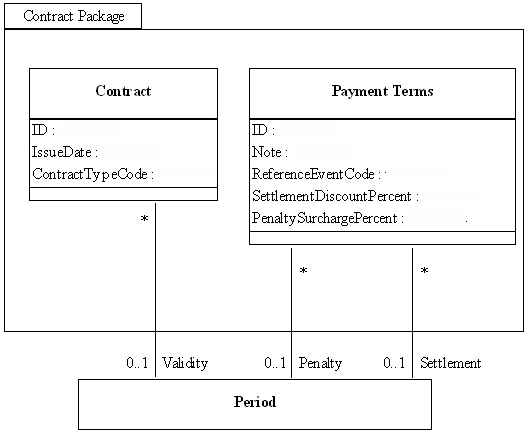 This section describes the business rules of the generic order-to-invoice process that are assumed as information requirements for the document types in UBL 1.0. The Order may specify allowance and charge instructions (e.g. freight, documentation, etc.) that identify the type of charge and who pays which charges. The Order can be placed “on account” against a trading credit account held by the Seller, or against a credit/debit card account, or a direct debit agreement. The Order allows for an overall currency defining a default for all pricing and also a specific currency to be used for Invoicing. Within an Order, additional currencies can be specified both for individual item pricing and for any allowances or charges. Trade discount may be specified at the Order level. The Buyer may not know the trade discount, in which case it is not specified. This makes a detailed response from the Seller necessary; see Order Response (5.2.3). The Order provides for multiple Order Lines. Each Order Line provides for specification of a single place of delivery, and a schedule of quantities and requested delivery dates. The Buyer may indicate potential alternatives that are acceptable. For each Order Line, an Alternative Item can be included. The Alternative Item may be specified by any one of the range of Item identifiers. For example, the specified Quantity may change, e.g. 20x6-packs as an alternative to 10x12-packs. The Order Response Simple is the means by which the Seller confirms receipt of the Order from the Buyer, indicating either commitment to fulfill without change or that the Order has been rejected. Proposed changes by the Seller are accomplished through the full Order Response document. The Seller may advise replacements or substitutes which will be made, or changes necessary, using the Order Response. The Substitute or Replacement Item may be specified by any one of the range of Item identifiers. For example, the specified Quantity may change, e.g. 20x6-packs as a replacement for 10x12-packs. The Buyer can change an established Order in two ways, subject to the legal contract or trading partner agreement: first, by sending an Order Change, or second, by sending an Order Cancellation (see 5.2.5) followed by a new, complete replacement Order. At any point of the process, a Buyer can cancel an established order transaction using the Order Cancellation document. Legal contracts, trading partner agreements, and business rules will restrict at what point an Order Cancellation will be ignored (e.g. at the point of manufacture or delivery process initiation). Given the agreements and rules, an Order Cancellation may or may not be an automated business transaction. The terms and conditions of contract formation for business commitments will dictate which, if any, of these restrictions or guidelines will apply. The Receipt Advice is sent by the Receiver (Buyer) to the Seller to confirm receipt of items and is capable of reporting shortages or damaged items. The Receipt Advice allows the Receiver to state any shortages from the claimed despatch quantity and to state any quantities rejected for a given reason. As presently arranged, the Receipt Line allows for one rejection quantity and reason. However, additional reasons for rejection of quantities of the same item could be achieved by subdividing the Receipt Line so that there are multiple Receipt Lines to one Despatch Line. The Invoice only contains the information that is necessary for invoicing purposes. It does not reiterate any information already established in the Order, Order Change, Order Response, Despatch Advice, or Receipt Advice that is not necessary when invoicing. If necessary, the Invoice refers to the Order, Despatch Advice or Receipt Advice by a Reference for those documents. Taxation on the Invoice allows for compound taxes, the sequence of calculation being implied by the sequence of information repeated in the data stream (e.g., Energy tax, with VAT — Value Added Tax — superimposed). The Invoice does not cover Debit and Credit Notes, nor does the process include a Customer Account Statement that summarises Invoices, Credit Notes, and Debit Notes to be paid. Item structures are found throughout the document types in the generic process. Item Identification according to a system promulgated by a standards body. The Item Identification assumes that each different packaging of an Item (e.g. a 6-pack and a 12-pack of the same item) has a different Item Identifier. For any given Item, price ranges by amount, quantity, etc. are not repeated back to the Seller; only the active price is specified. The Buyer may not know the Item Base Price, in which case it is not specified. This makes a detailed response from the Seller necessary; see OrderResponse. Although ordered items may include Hazardous items, as it is not necessary to specify related information at the order stage. The Buyer may not be aware of the nature of the Item. Indication of the Hazardous nature of the Item, and any relevant information, would be indicated in the Despatch Advice. The UBL XSD schemas are implementations of the document assembly models defined by UBL. They are the only normative representation of the UBL 1.0 document types and library components. All of the UBL 1.0 XSD schemas are contained in the xsd/ subdirectory of the UBL 1.0 release package (see Appendix A for more information regarding the structure of the 1.0 release package and Section 6.4 for information regarding dependencies among the schema modules). The xsd/ directory is further subdivided into xsd/maindoc/, xsd/common/, and xsd/codelist/ subdirectories. The XSD schemas defining the eight basic document types that support the generic UBL 1.0 order-to-invoice process are located in the xsd/maindoc/ directory, as listed below. The xsd/common directory contains six schemas referenced by the eight document schemas in xsd/maindoc. Two of these common schemas contain the UBL library of reusable data components from which the main document schemas are assembled; three contain definitions needed to implement [CCTS] conformance; and one provides a consistent format for schema metadata. The name of each schema file together with a brief description of its contents is given below. This schema defines the global Basic Business Information Entities (BBIEs) that are used throughout UBL, serving, in effect, as a “global BBIE type database” for constructing documents. As specified by the UBL Naming and Design Rules, this schema does not include BBIEs having Code or Identifier datatypes; these are defined locally wherever they are used. This schema provides Core Component Types as defined by [CCTS]. These types are used to construct higher-level datatypes in a standardized and consistent manner. This schema should not be modified. This schema defines Unqualified Data Types for primary and secondary representation terms as specified by [CCTS]. Derived from Core Component Types, these XSD complexType structures are the basic data types from which all other data types must derive. This schema should not be modified. This schema provides Qualified Data Types as defined by [CCTS]. These XSD complexType structures are derived from Unspecialized Datatypes by extension, restriction, and other contextual constraints, such as facets. The Specialized Datatypes have been customized for the UBL 1.0 procurement process and may be further extended to support additional datatypes required for other business contexts. NOTE: The terms “specialized” and “unspecialized” are used instead of the terms “qualified” and “unqualified” in order to avoid confusion with qualified and unqualified names in [XSD1][XSD2]. The thirteen code list schemas required for UBL 1.0 are included in the xsd/codelist directory. These code list schemas allow component instances conformant to any of the main document schemas to be validated against code list values. See Appendix E for further information about the form of representation used for UBL code lists. 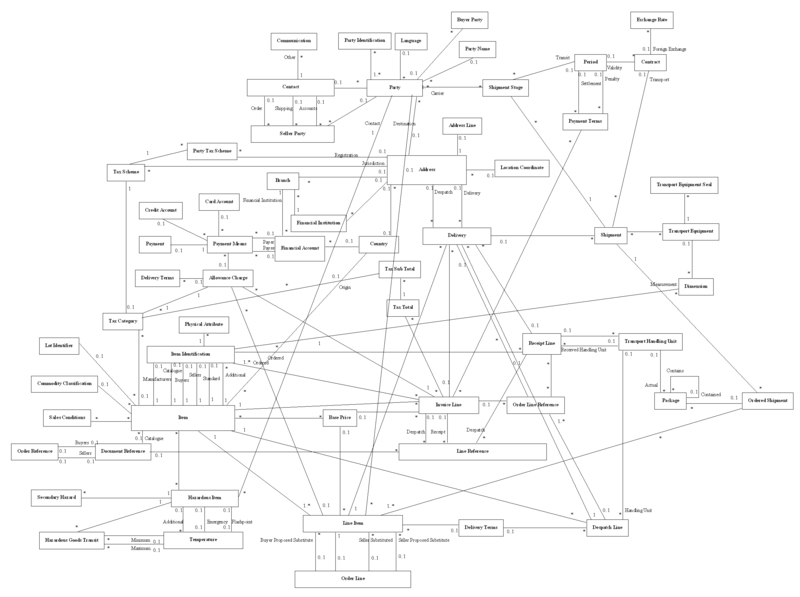 The following diagram shows the dependencies among the schema modules comprising a UBL 1.0 document schema. Note that (as in the other UML diagrams used in this release) dependent components point to the components upon which they depend. The UBL 1.0 specification is published as a zip archive named cd-UBL-1.0.zip. Unzipping this archive creates a directory named cd-UBL-1.0 containing a master hypertext document (this document, index.html) and a number of subdirectories. The files in these subdirectories, linked to from index.html, contain the various normative and informational pieces of the 1.0 release. A description of each subdirectory is given below. Certain components in the library allow recursive nesting. For example, a Package may contain other Packages, a Delivery may specify another Delivery, etc. These are legitimate business data structures. Most real-world applications will limit the depth of recursion in such structures, but XSD schemas are incapable of expressing this constraint. Implementors should be aware of this and may wish to set limits on the depth of recursive structures in their applications. UBL does not mandate the use of a specific formal development method. The purpose of this section is to describe the process that evolved during the development of UBL so that implementers can understand the role of the various technical artifacts included in this package. They may also choose to adapt this approach to suit their requirements. The approach used to develop UBL 1.0 is shown in the diagram below. The initial UBL library of data components was based upon the xCBL 3.0 schema library, which was itself based on the UN/EDIFACT and ANSI X12 EDI component libraries. Upon review, it was felt necessary to create an abstracted conceptual model of the entities in a form that would better support an iterative development lifecycle. UBL uses two types of conceptual models, a single model for defining information components and a set of models for describing how these components are assembled into document definitions. 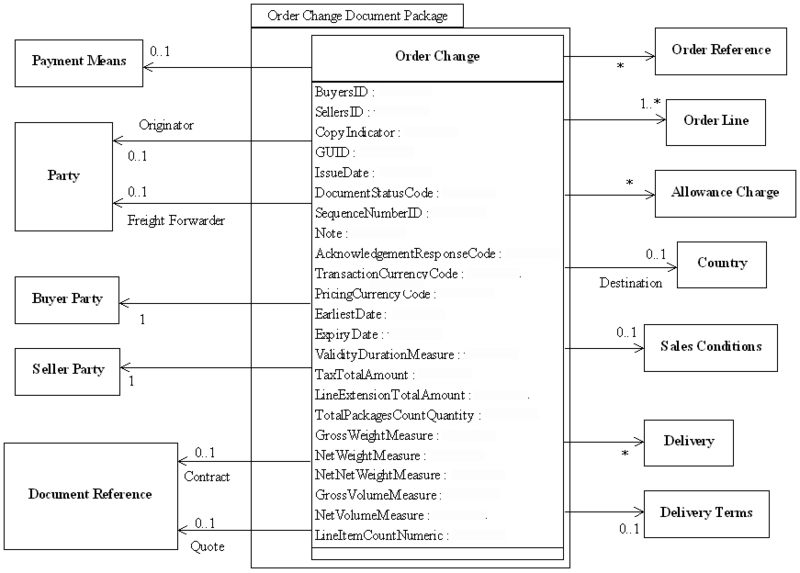 The former is referred to as the document component model and is generally presented using UML class diagrams (see B.2 below); the latter are referred to as the document assembly models and are generally presented using spreadsheets. The identification and assembly of the components required by the UBL 1.0 Procurement Process was carried out manually using business knowledge of the domain, the component model, and the requirements of [CCTS]. Individual spreadsheets were developed for each document type in the UBL 1.0 procurement scenario, and all re-used components were combined into a separate spreadsheet. Additional spreadsheets were used to model the Core Component Types (CCTs), Unspecialized Datatypes (UDTs), and Specialized Datatypes (SDTs) as specified by [CCTS]. The full set of spreadsheet assembly models used by UBL 1.0 is described in Section B.3. The UBL schemas contained in Section 6 of this specification were then generated automatically from the spreadsheet assembly models following the UBL Naming and Design Rules referenced in Section B.4 according to the process described in Section B.5. Implementation models were then generated from the schemas to serve as an aid in implementing UBL. 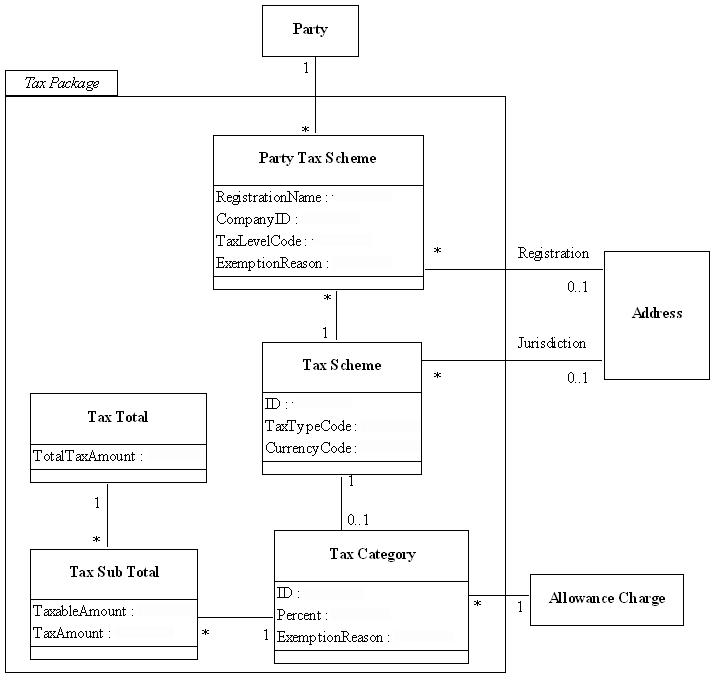 These UML class diagrams, provided in Section B.6, represent the implementation of the document assembly models described in the spreadsheets. 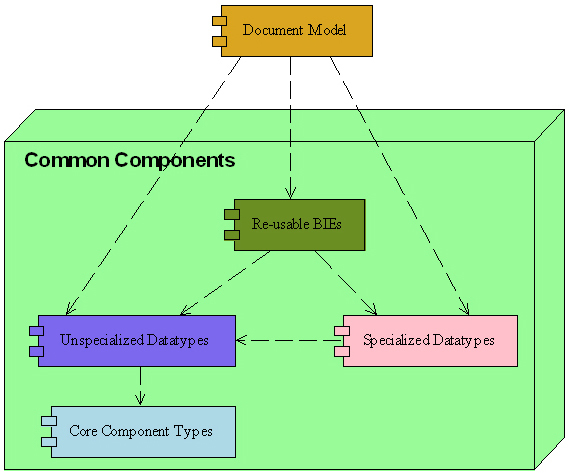 The UBL document component model describes the information components used in all of the documents defined by UBL 1.0. The document component model is the result of a detailed analysis of the data requirements to support the UBL 1.0 Procurement Process (see Section 5). During the modeling process, common items of data were identified by a process of normalization to identify aggregates based on functional dependency. Where appropriate, these were generalized so that they could be re-used to support the various business documents. The component model is best viewed as a series of UML Class Diagrams. For legibility, the model does not contain all the metadata required for document assembly. 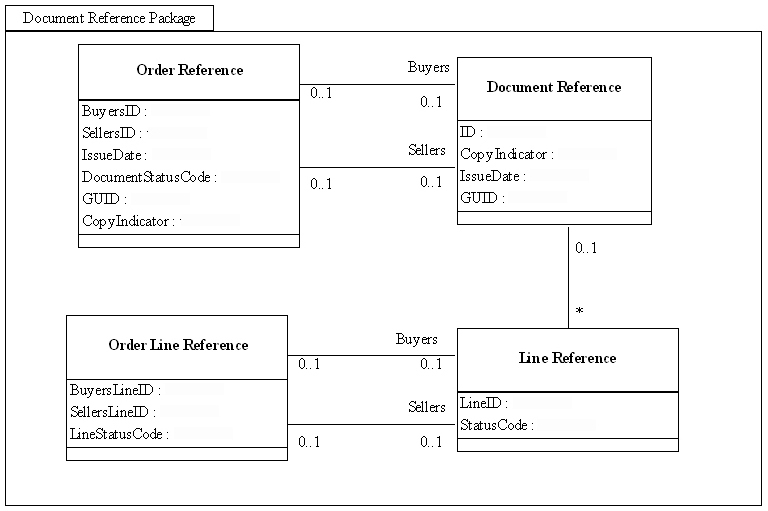 Figure B-2 shows the overall UBL document component model. To facilitate comprehension of this diagram, it has been decomposed into several packages. 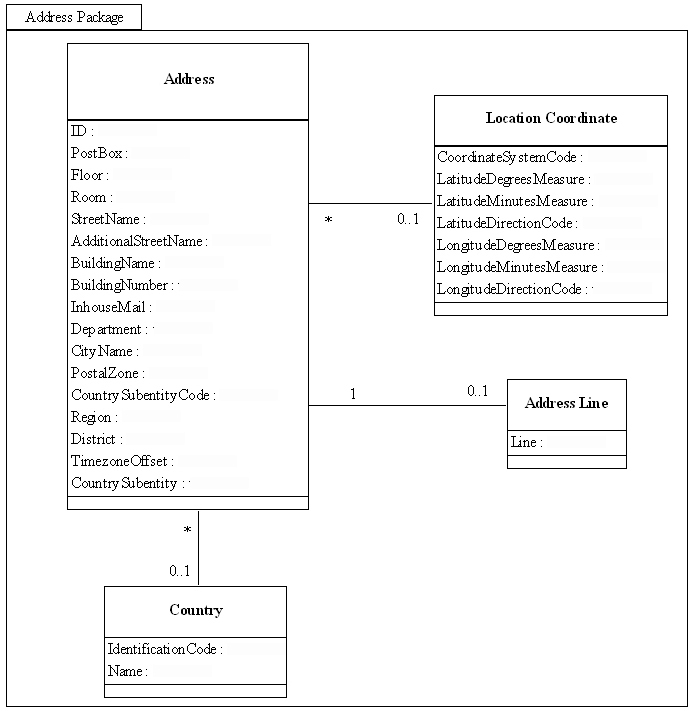 Each package represents a logical grouping of components and is described by its own UML class diagram, which displays both the attributes (Basic BIEs) and object classes (Aggregate BIEs) belonging to the components grouped in the package. The scope of each package is arbitrary and does not hold any significance beyond these diagrams. 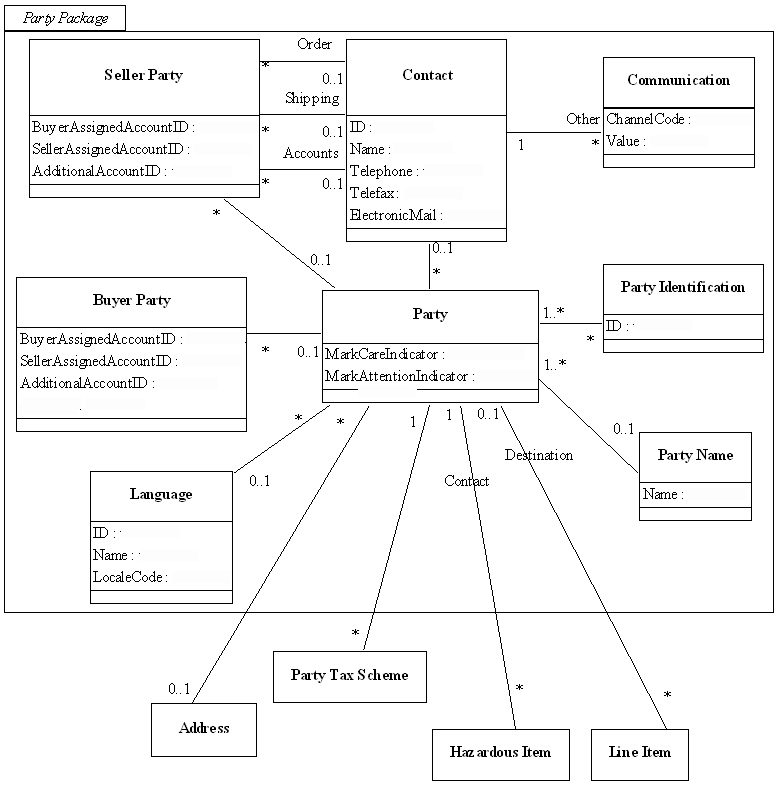 For example, the Party reusable component package is shown below. The complete set of packages for all the UBL components is listed below. No specific directions are defined for the associations in these models; they can be navigated in either direction. The specific navigation path for each association is defined when documents are assembled. To define different types of documents, the components described in the previous section are assembled into hierarachical structures based on the requirements of the context — in this case the UBL 1.0 Procurement Process — and the metadata requirements of [CCTS]. Document assembly starts with the definition of each of the business documents comprising UBL 1.0 as an Aggregate BIE (object class) for the document type. All the other Aggregate BIEs (object classes) for the document type are derived by traversing the associations from this Aggregate BIE to form the required hierarchy. The roles chosen for each association between Aggregate BIEs become Association BIEs. 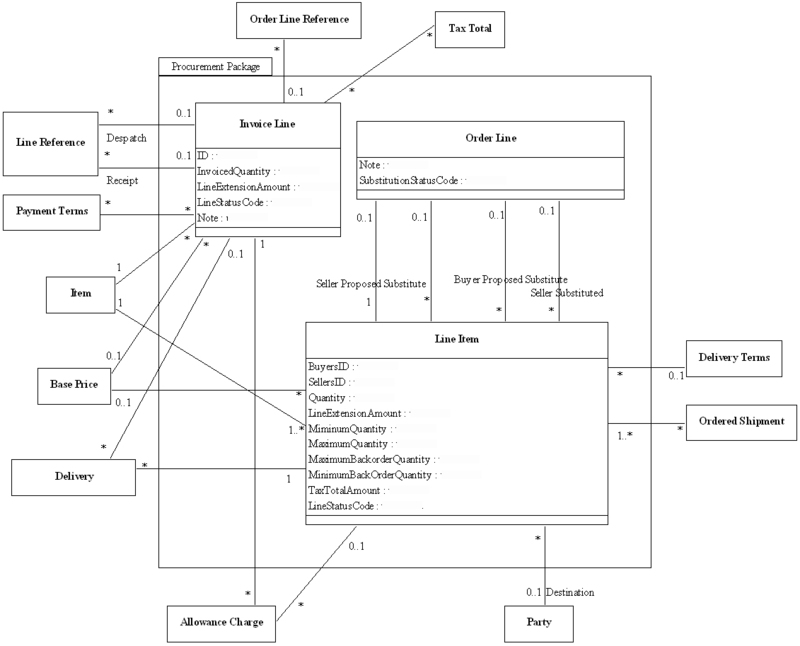 For example, the document assembly model for the top level of the UBL 1.0 Order document is shown below using a UML class diagram. The top level document assembly models for the eight business documents defined by UBL 1.0 are given below. These advantages were felt to outweigh the main disadvantage of spreadsheet notation, which is the lack of referential integrity controls in the modeling language itself; manual editing is required to control the impact of changes. In this case, fortunately, the commercial tool used to generate the final schemas from the spreadsheets was also capable of verifying model integrity. UBL uses spreadsheets to describe the assembly of components into specific types of documents. There is one spreadsheet assembly model for each document type. Following the terminology of [CCTS], the document assembly models are composed of a combination of Basic Business Information Entities (the attributes of the component model), Aggregate Business Information Entities (the object classes of the component model), and Association Business Information Entities (the roles of associations in the component model). BBIEs can be considered the “leaf nodes” of the data structures, ABIEs as structures that contain BBIEs, and ASBIEs as the containership of one ABIE within another. The spreadsheet models use rows to define components. Components are either BIEs or Data Types. Columns define the metadata associated with each component type. Many of the spreadsheet columns are determined by [CCTS] requirements. A spreadsheet assembly model will therefore consist of a “root” ABIE, a set of BBIEs, and a set of ASBIEs. The ABIEs associated with the “root” ABIE are defined in a Reusable BIE spreadsheet model. The data types for all BBIEs are defined either in the Unspecialized Datatypes spreadsheet model or the Specialized Datatypes spreadsheet model. The dependencies among these spreadsheet assembly models are shown in the diagram below. The spreadsheet files included in this package are provided in both Microsoft Excel format (.xls) and Open Office format (.sxc) as described below. NOTE: The UBL document schemas are automatically generated from these spreadsheet models. However, the normative forms of the UBL documents are not these spreadsheet models but the XSD schemas themselves, which are provided in Section 6. Each business information entity (BIE) is defined in a single row. Row background colour distinguishes between BBIE (white), ABIE (pink), and ASBIE (green). This model provides the Aggregate Business Information Entities (ABIEs) that are used throughout UBL, serving, in effect, as an “ABIE type database” for constructing the main documents. This model may be modified in customization. Key: each business information entity (BIE) is defined in a single row. Row background colour distinguishes between BBIE (white), ABIE (pink) and ASBIE (green). This model provides Core Component Types as defined by [CCTS]. These types are used to construct higher-level datatypes in a standardized and consistent manner. This model should not be modified. Key: each core component type (CCT) is defined in a single row. Row background colour distinguishes between Supplementary Components (white) and core component types (pink). This model specifies Unqualified Data Types as defined by [CCTS]. These types are used to construct higher-level datatypes in a standardized and consistent manner. This model should not be modified. Key: each data type (DT) is defined in a single row. Row background colour distinguishes between Supplementary Components (white) and data types (pink). This model specifies Qualified Data Types as defined by [CCTS]. These types are used to construct higher-level datatypes customized to specific implementations. UBL has chosen to define datatypes for BBIEs that require validation against a code list as Specialized Datatypes. They are specialized forms of the Code datatype with fixed values as given in this model. Note that the implementation of these code lists is realized as individual schemas for each code list. This model may be modified in customization. First, any modification of the spreadsheet models requires an understanding of their structure, the ebXML Core Components Technical Specification [CCTS], and the various UBL library constituents. For example, some columns are updated directly, while others have formulas in their cells which implement [CCTS] and UBL Naming and Design Rules. Awareness of this is necessary when adding or editing the row contents. Care should be taken to avoid updating cells that contain formulas. Second, schema generation should be compliant with the UBL Naming and Design Rules (B.4 below) to promote compatibility with other UBL component libraries. Third, the data types defined in the Core Component Types and Unspecialized Datatypes models are direct implementations of those defined in [CCTS] and should not be modified without recognition of this fact. The Specialized Data Types model is provided for implementation-specific data types. 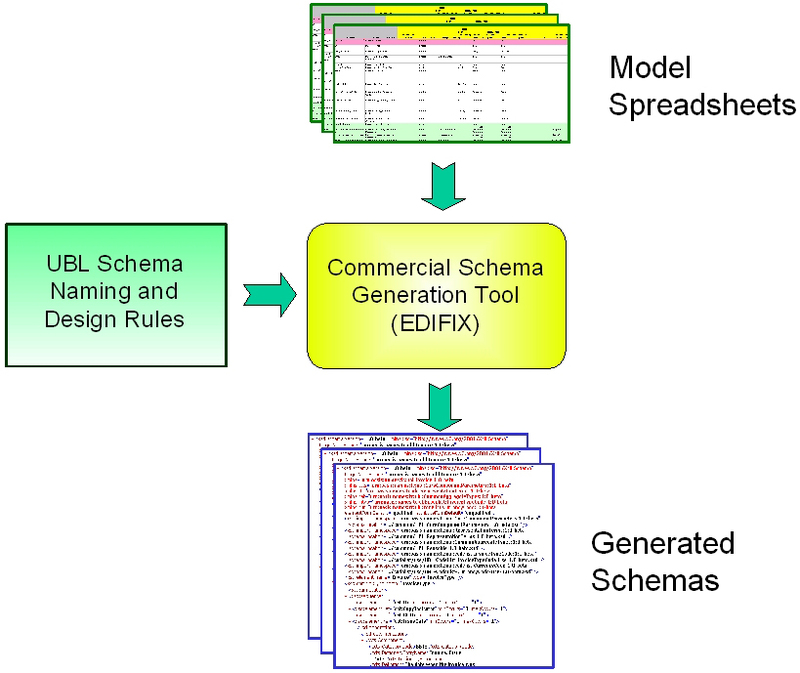 A commercial CC-aware schema generation tool, GEFEG EDIFIX® 5.0, was used to read the spreadsheets as UML data models, perform Q/A with them, and produce a schema representation adhering to the UBL 1.0 Naming and Design Rules, as illustrated below. For information regarding GEFEG EDIFIX®, see http://www.gefeg.com/en/standard/xml/ubl.htm. The GEFEG EDIFIX® 5.0 UBL Reader is free and offers easy viewing of UBL schemas and data models. For information regarding GEFEG EDIFIX® UBL Reader, see http://www.gefeg.com/en/edifix/reader-ubl.html. Previous drafts of the UBL specification used different tools for this process. For a description of the process used to produce the UBL 1.0 Beta schemas, see Appendix D of the 1.0 Beta Committee Draft at http://www.oasis-open.org/committees/ubl/lcsc/UBLv1-beta/. The implementation model of UBL represents the actual UBL XSD schemas as a UML model. This is produced by automatically transforming the schemas into a model conformant with the Unified Modeling Language [UML]. 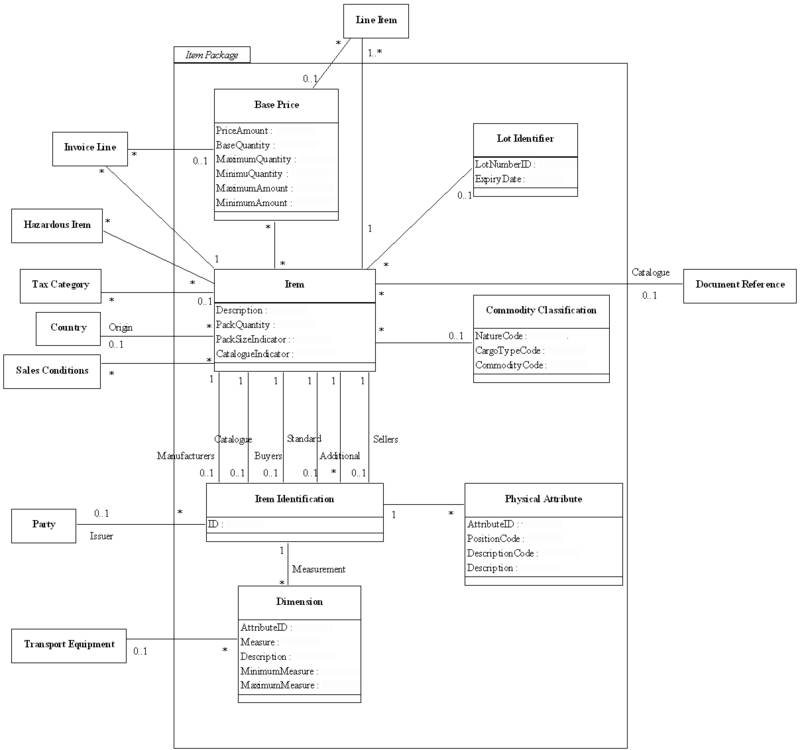 This model is then used to produce a set of class diagrams that illustrate each of the main documents and several views of the reusable components. 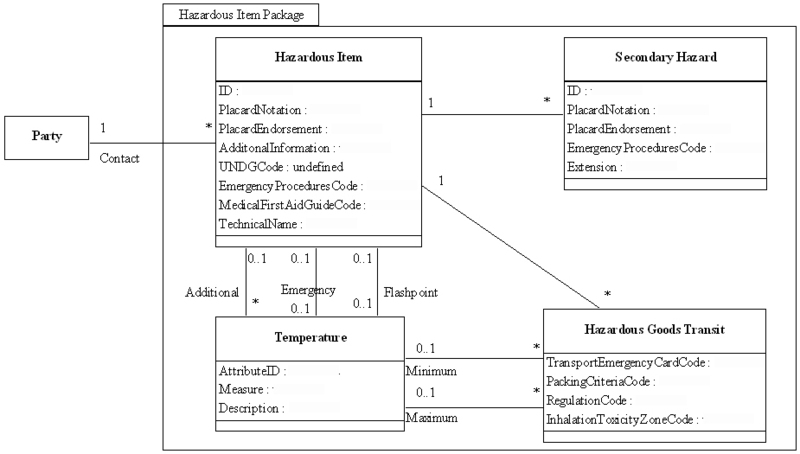 The automated transformation and diagram creation was performed using a commercial schema-to-UML transformation tool, Ontogenics hyperModel. For further details regarding this product, see http://www.xmlmodeling.com/. The UML class diagrams contained in this section are intended to help understand the UBL schemas without requiring an understanding of XSD syntax. In order to do this, the diagrams intentionally suppress some of the detail contained in the schemas. For example, information regarding the order of elements within a complex type definition is not preserved in the diagrams. Other changes were made to make the UML model useful for software engineering; for example, the “Type” suffixes of XSD complexType names are removed when creating the UML class name to yield an object class name independent of XSD syntax, and complex type child elements with simple content values are represented as class attributes, whereas elements with complex content are represented as associations to those type classes. 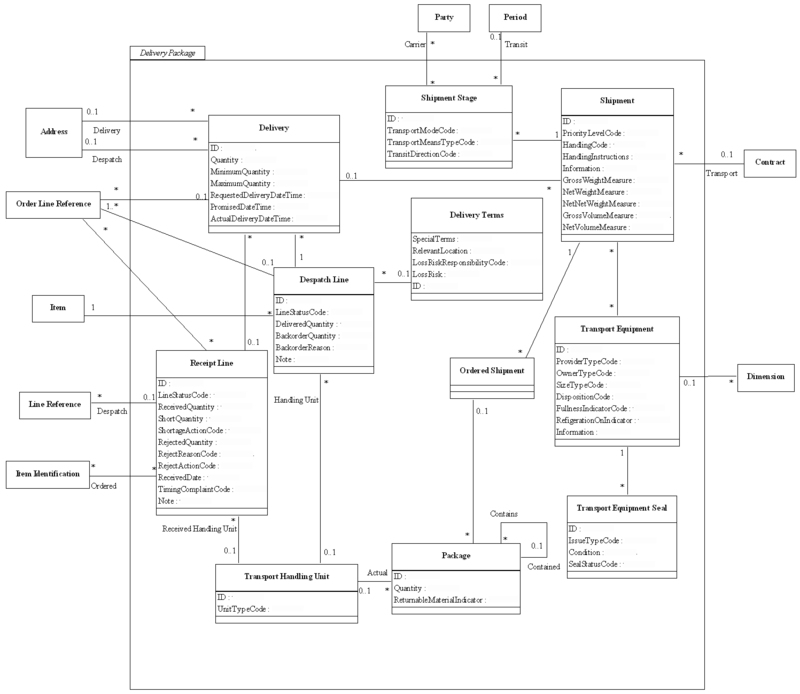 These diagrams are the UML equivalent of the document assembly spreadsheet models. 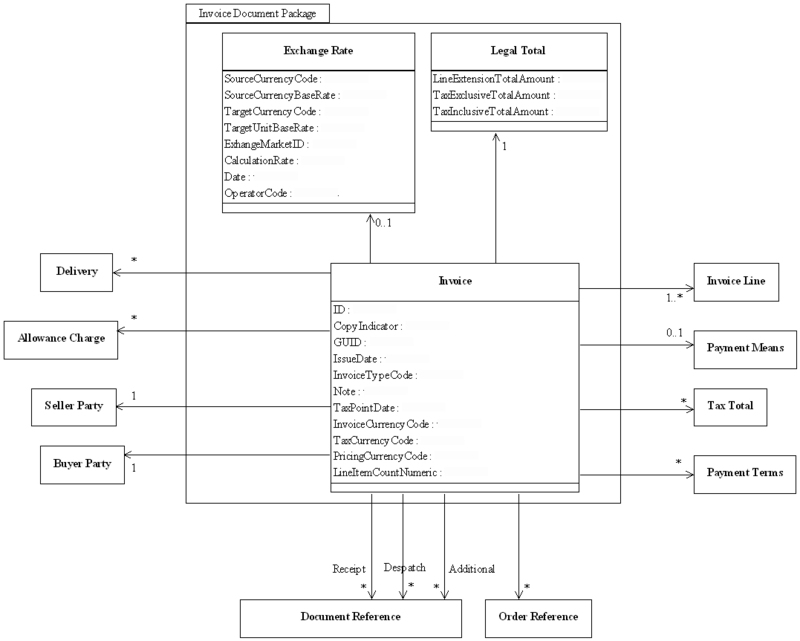 An implementation class diagram has been created for each of the eight UBL 1.0 document types. As noted above, the implementation diagrams are simplified views that suppress details of the types contained in these aggregate structures. 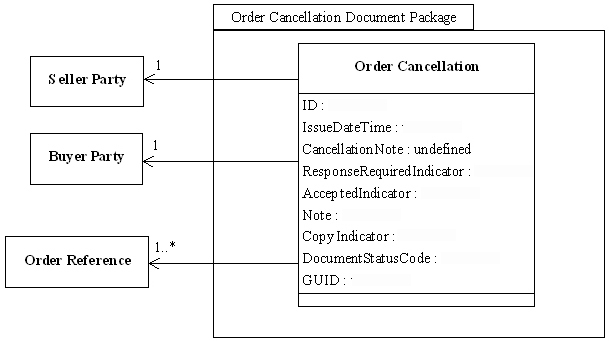 As an example, the class diagram for the UBL Order document is shown in the figure below. The document implementation class diagrams contained in the UBL 1.0 package are listed below. 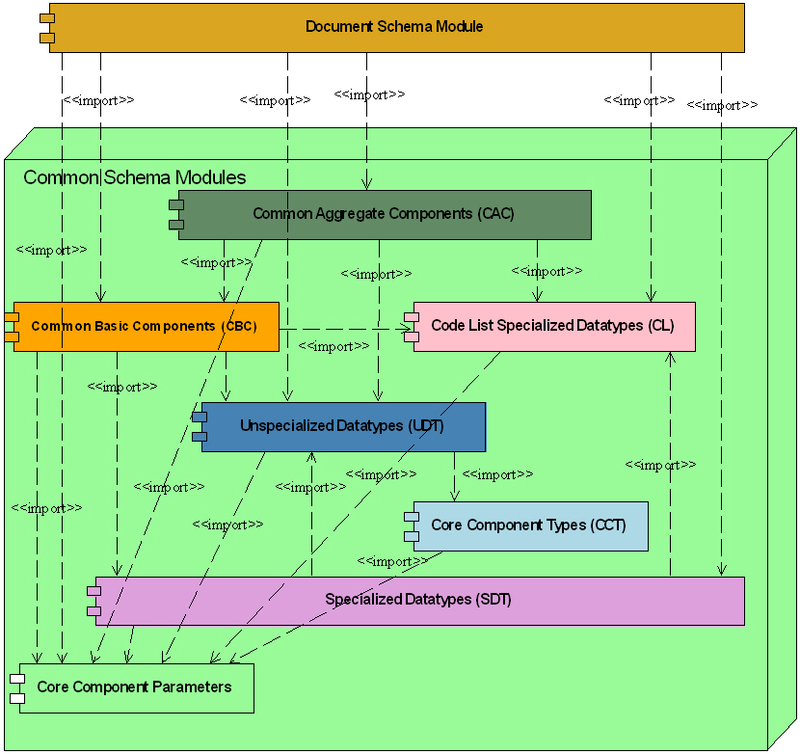 In addition to the main document diagrams, this release contains ten class diagrams that present views of the packages of reusable components used in the documents. 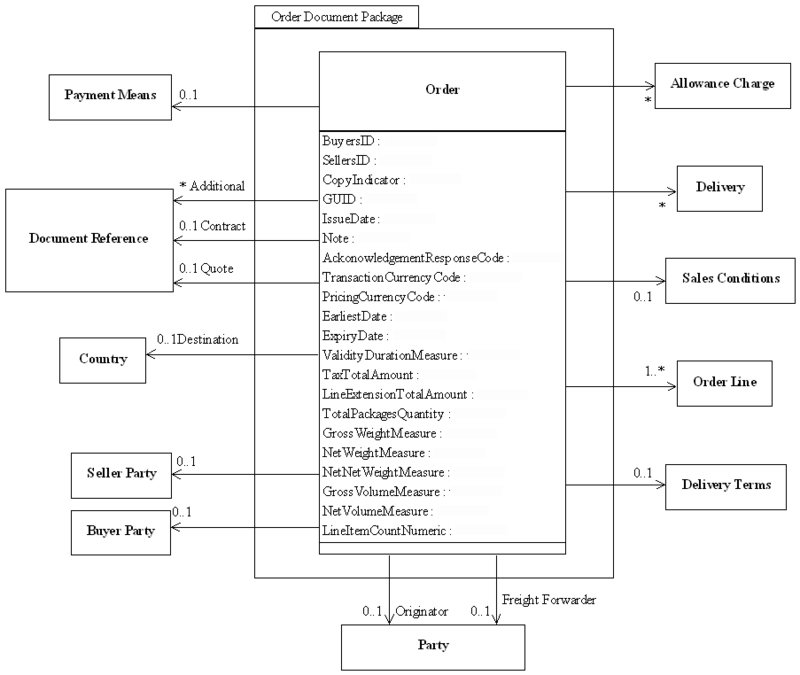 For example, the Order diagram includes associations to Party, SellerParty, and BuyerParty. The following implementation diagram shows these components in detail. This part of the package also includes PDF renderings of the example instances provided in Appendix D below. This appendix provides example instances of UBL documents being used in two different versions of the order-to-invoice process. The first set of examples illustrates the buying of office supplies, and the second set illustrates the buying of joinery (building supplies). Also included are printed versions of each example document created in accordance with the formatting specifications referenced in Appendix C.
The buyer, Bill’s Microdevices, orders several different items from an office supply store. The buyer knows the supplier’s codes for the items and the price for each. The buyer decides to change the original order. The seller, Joe’s Office Supply, replies with an Order Response Simple to indicate the acceptance of the order. The seller also gives his reference number for the order, i.e., the sales order in his system, and tells the buyer whom to contact if he has any queries. The buyer cancels an Order (for purposes of illustration, not the same one). The seller advises the buyer of the despatch of the items ordered. The buyer notifies the seller of missing items. The seller raises the Invoice automatically when the despatch occurs, and the resolution of shortages etc. is handled post-invoicing. The Invoice shows the tax amount. The seller notes that payment is due within 30 days of Invoice. The buyer, Jerry Builders, PLC. in the UK, orders a number of windows, a door set, and some lengths of timber for delivery to a building site. Jerry knows the supplier’s codes for the items, and that he must also specify a number of physical attributes to get the precise item that he wants: some windows are asymmetric and are “handed” left or right; most door sets are handed, as they are hinged on one side; the wood and its finish must be specified, as must the “fittings” (handles, stays etc.). Items can be glazed in different ways. Loose timber is coded according to its cross section, and the length must be specified. While the buyer knows these things from the catalogue, he does not know the current prices or any discount rate he may get. The seller, Specialist Windows PLC, replies with a detailed Order Response to indicate the unit price of each item and to inform the buyer of the trade discount that he will be given. At the same time, the seller gives his reference number for the order, i.e. the identity of the order in his system, and also tells the buyer whom to contact if he has any queries. The seller advises the buyer of the despatch of the items ordered, which will in fact be delivered on two pallets (i.e., transportation units) identified as “A” and “B”. The Despatch Advice lists the items in order line sequence and refers to the pallet on which the item is delivered. The Despatch Advice travels with the delivery; a paper copy is signed and returned as proof of receipt. Hence the UBL Receipt Advice is not used. This example is based on the products, product identification, business requirements, and practices of a real UK joinery manufacturer and sales company. It operates its own specialized transport fleet, delivering all over the United Kingdom and to offshore islands. The ASN.1 UBL specification was created using a tool from OSS Nokalva (http://www.oss.com/) that conforms to ITU-T Recommendation X.694 | ISO/IEC 8825-5 for converting XSD Schema to ASN.1. After conversion, the generated ASN.1 was formatted by the PrettyPrint tool at the ASN.1 Information Site (http://asn1.elibel.tm.fr) to produce the HTML file included in this package. UBL 1.0 achieves the basic objective of the first phase of the UBL charter — to develop a workable standard library of XML business documents. The second phase (UBL 2.0) is intended to produce additions to the UBL library and schema set and a mechanism for the automatic generation of context-specific business schemas. Between these milestones lie a number of work items that for one reason or another could not be completed in time for delivery of UBL 1.0. Some of these items represent work of continuing interest; others represent cases where an issue could not achieve a consensus solution within the time set for UBL 1.0 delivery but for which an acceptable short-term strategy could be adopted with little or no impact on the long-term validity of UBL 1.0 document instances. The UBL TC intends to resolve these issues and release an updated version called UBL 1.1 that will be backward-compatible with UBL 1.0 instances. In the following, these work items have been loosely grouped under four headings: NDR Work Items, Interoperability Work Items, Registry Work Items, and Localization Work Items. Persons interested in participating in this program of work are invited to join the OASIS UBL TC. The following items are related to UBL Naming and Design Rules (NDR). Time constraints prevented completion of the UBL Naming and Design Rules (NDR) document as a separate specification for delivery with UBL 1.0; the document included in this package and referenced as [NDR] contains only the rules checklist for 1.0. Work continues to prepare the NDR document for submission as a separate OASIS technical specification. The UBL Code List Subcommittee has produced a comprehensive solution for code lists (see Appendix E) that relies upon XSD substitution groups for code list customization. Lacking a clear industry consensus on the use of XSD substitution groups in business document schemas, the UBL TC has deferred the adoption of this extension mechanism for code lists pending further discussion. Care has been taken to construct UBL 1.0 in a way that will allow the adoption of substitution groups (if deemed appropriate) in later releases without invalidating UBL 1.0 instances. It is an open question whether it is better to import the codelist schema modules (Section 6.3) indirectly via the Specialized Datatype schema (Section 6.2.2) or directly into the Common Aggregate Component schema (Section 6.2.1) and any individual document schemas where they are used. In UBL 1.0, codelist schema modules are imported directly, but concerns have been raised regarding a possible impact on performance. Feedback from UBL 1.0 implementation will be relied upon in resolving this issue. A change to the alternative is not expected to affect UBL 1.0 instances. In UBL 1.0, all BBIE properties are declared as elements and defined as complex types in the Common Basic Components schema (Section 6.2.1). Alternatively, the qualified BBIE property elements could be declared in either the Common Aggregate Components schema or in the individual document schemas where they are used. This issue remains open, but any change in future releases will not affect UBL 1.0 instances. The following issues relate to the storage and registration of UBL schemas. UBL NDR identified a requirement for absolute path names for schema locations as a necessary requirement for standards based schemas to ensure consistency, clarity, and absolute assurances that the UBL normative schemas are in fact being used. However, current OASIS architecture limitations preclude the availability of a suitable registry/repository to support this requirement. As a result, UBL 1.0 has been released using relative path names for the location of schemas in order to facilitate offline validation and to work around those limitations. Use of absolute paths and a registry for the component library will be implemented in a future version as the supporting infrastructure becomes available. UBL 1.0 assumes that the version number of each UBL datatype and BIE is also 1.0. However, there is some debate as to whether this is a schema construct artifact or a storage artifact. The outcome of this decision may result in a requirement to assign a version number in the annotation documentation for each datatype and BIE schema construct. The following work items relate to the interoperability of UBL documents across industries and in relation to other business document standards. While much initial work has been done toward defining the concept of UBL conformance in the UBL 1.0 Customization Guidelines (see Appendix B.7), further work is necessary to create a definition of UBL conformance that is usable in legal and regulatory contexts. It is considered likely that UBL 1.0 will be modified according to the UBL Customization Guidelines to create versions that are standard within particular industries and geographical regions. Further work is needed to develop guidelines specific to this use case. A common set of CCTS schemas are expected to be available for UBL 1.1 and will be included at that time. This is not expected to affect the validity of UBL 1.0 instances. As an implementation of [CCTS], UBL supports the concept of a common semantic library of business components. To achieve this, UBL is working with the UN/CEFACT International Trade and Business Processes Working Group on Harmonization, known as TBG17 (http://webster.disa.org/cefact-groups/tbg/wg/tbg17_main.cfm). This group is responsible for consistency and harmonization of business process models and core components across business domains and sectors, contributing to a concise and well-defined glossary of business terms, business data semantic definitions, and structuring of data exchanges. Cooperation with TBG17 is a continuing work item for UBL. While the delivery of an automatic context methodology belongs to UBL 2.0, work on this item continues in the UBL 1.1 time frame. This includes further refinement of the Customization Guidelines referenced in B.7 of this specification. UBL has formed several localization subcommittees (LSCs) to translate the UBL specification and associated documentation into languages other than English and to represent the UBL effort in non-English-speaking regional contexts. These regional initiatives will account for much of the work to be performed in the UBL 1.1 time frame. As of April 2004, UBL localization subcommittees had been established for Chinese, Japanese, Korean, and Spanish. Copyright © 2001-2004 OASIS Open, Inc. All Rights Reserved.